Texas Tech locked down Gonzaga in the second half and beat the Bulldogs 75-69 to earn a trip to the Final Four on Saturday, and one of the biggest plays of the game was a block from Red Raiders big man Tariq Owens on Gonzaga standout Rui Hachimura. Down by six with a minute to play, Hachimura got the ball in the corner and tried a three. However, Owens rose up and not only blocked it, but also saved the ball from going out of bounds, giving the ball back to Tech with a jaw-dropping display of athleticism and instinct. The trouble is, there is no way Owens saved that ball legally. 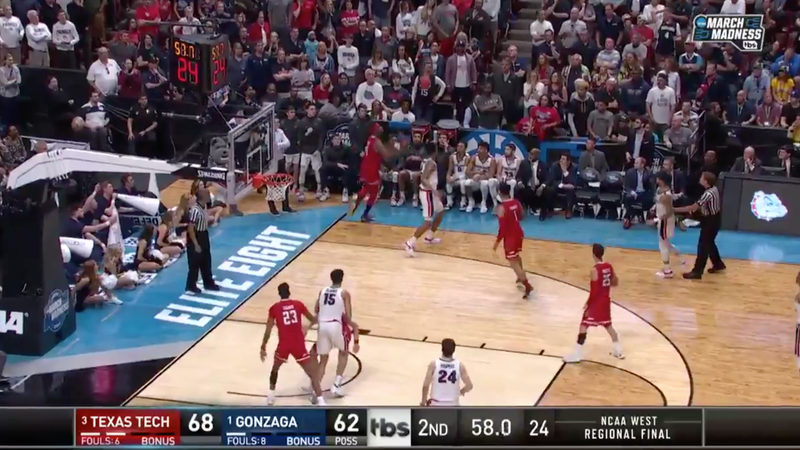 Just one glance at a replay was enough to show that he had a foot down out of bounds as he took off for the save, and the possession should have stayed with Gonzaga. But that’s not reviewable, so the Red Raiders went up by seven, then held on for a victory. Legit or not, it’s still a badass play.